The Battlin’ Bear football team is setting a new standard for itself this season under head coach Jason Petrino. Although they had to forfeit their first win of the season over Carroll College, due to an ineligible player reported in the game, they have not wavered and continue to build momentum as the season goes on. A few notable victories for the Bears this season include their upset over top 5 ranked Southern Oregon (34-21), their second win over Carroll College (42-21) and their recent victory over ranked Montana Western (43-14). This placed the Bears at no. 12 in the NAIA coaches poll as of Oct. 29. While the Bears are rolling in the Frontier conference, their chances at the postseason relies on their last two games against no. 24 Eastern Oregon on the road, and Montana Tech at home. So far, the Battlin’ Bears stand at 6-2 in conference play and 7-2 overall with a 5-game win streak. As a team, the offense averages 36 points per game. They average 160 rushing yards and 313 passing yards per game. The defense holds their opponents to an average of 17 points per game. A few notable players on the offensive side of the ball include quarterback Jacob Bakken, running backs Sam Sparks and Mason Melby, receivers Max Gray, Lucas Overton, and Taylor Schwartz, and tight-ends Darneail Jenkins and Brandon Mosley. Quarterback Jacob Bakken has thrown a career high of 27 touchdown passes this season, along with 2,649 passing yards, an average of 294 passing yards per game, and a completion rate of 65 percent. Running back Sam Sparks leads the team with 416 rushing yards and 5 touchdowns on the season. Receiver Max Gray leads the Bears with 784 receiving yards and 10 touchdowns on the season. On the defensive side, senior linebacker Chase Bertelsen had 28 solo tackles, defensive end Ryder Rice had 11 sacks, and senior defensive back Keenan Fagan with 4 interceptions. The Battlin’ Bears football team made a strong case for a postseason bid this past weekend against no. 24 Eastern Oregon. They would go on to beat the Mountaineers 48-10. Rocky made the first score of the game with a 1 yard touchdown run by Mason Melby in the 1st quarter. The Bears went on to score three times in the second quarter with a 40 yard pass from Jacob Bakken to Max Gray, a 17 yard pass from Jacob Bakken to Darneail Jenkins, and a 13 yard pass from Jacob Bakken to Darneail Jenkins. This would put Rocky Mountain College up 27-0 against Eastern Oregon University at the end of the first half. The Battlin’ Bears did not back down going into the second half, as the team finished a 75 yard opening drive with another 1 yard touchdown run by Max Gray. Gray also caught a 4 yard pass from Jacob Bakken later in the 3rd quarter. Additionally, Josh Kraft caught a 5 yard touchdown pass from quarterback Drew Korf in the 4th quarter. The Battlin’ Bears held the Mountaineers to two field goals and one touchdown, totaling 10 points for Eastern Oregon. Rocky quarterback Jacob Bakken finished the game with 423 passing yards and 5 touchdowns. Running back Mason Melby lead the team with 83 rushing yards and 1 touchdown. Receiver Lucas Overton lead with 121 receiving yards, and Max Gray would have 117 receiving yards and 3 touchdowns. On the defensive side, senior defensive back Kendell Jefferson lead the Bears with 4 solo tackles, 1 assisted tackle, and 3 pass break ups. Defensive lineman Denton Wetherell execute a sack alongside sophomore defensive end Fili Church. Senior defensive lineman Ryder Ryce and senior defensive tackle Jojo Bones both had interceptions as well. 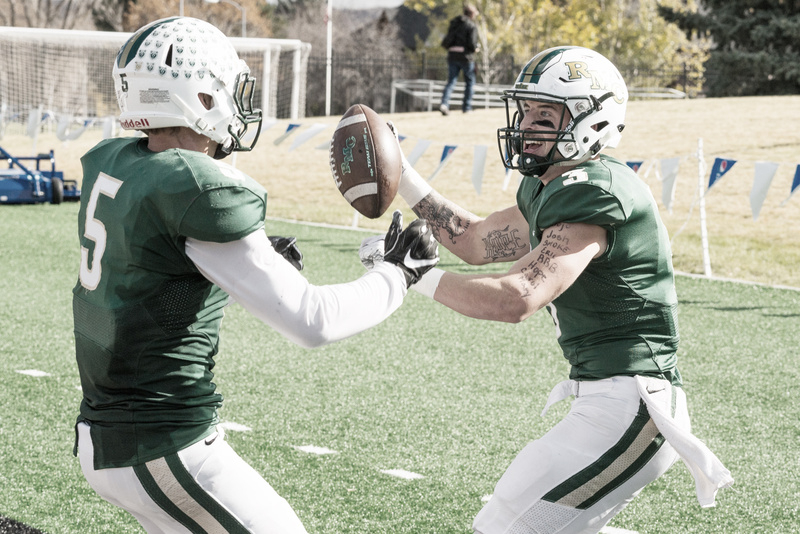 The Battlin’ Bears are now 8-2 overall for the season as they head into their final regular season game at Herb Klindt field for senior night against Montana Tech. The win over Eastern Oregon will likely put the Battlin’ Bears further up the NAIA coaches poll, and gives them a better chance at making a postseason appearance in the playoffs.